Beach Boys fever is about to sweep the country, with the band landing on our shores later this month for the first of five live Australian dates as part of their 50th Anniversary world tour. So what luck that the team with EMI has announced two brand new compilation albums to tempt their fans to part with a little more cash just after they’ve left. The Beach Boys’ ‘Greatest Hits’ will be released in September in two different formats – the first is a standard 20 track best-of, featuring hits like ‘California Girls’, ‘Wouldn’t It Be Nice’, ‘Surfin’ USA’, ‘Fun Fun Fun’, ‘Good Vibrations’ and ‘Kokomo’. 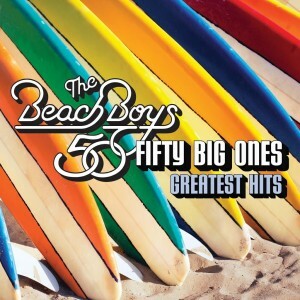 The second (cover pictured above) is called ‘Greatest Hits : 50 Big Ones’, which is a more comprehensive deluxe two disc set which not only includes the aforementioned singles, but plenty of others across its 50 tracks. EMI is also set to release 12 remastered Beach Boys studio albums on the same day as the two best-ofs. ‘Greatest Hits’ and ‘Greatest Hits : 50 Big Ones’ will both hit stores on Friday September 21.